25 January 2019 (Toronto, ON) - In honour of Blue Note Records’ 80th Anniversary, the legendary Jazz label is launching the Tone Poet Audiophile Vinyl Reissue Series. Blue Note President Don Was brought in “Tone Poet” Joe Harley—co-founder and co-producer of the acclaimed Music Matters audiophile vinyl series—to produce this new series of all-analog, mastered-from-the-original-master-tape 180g audiophile vinyl reissues in deluxe gatefold packaging. Mastering is by Kevin Gray (Cohearent Audio) and vinyl is being manufactured at Record Technology Incorporated (RTI). The titles were handpicked by Harley and cover lesser-known Blue Note classics, modern era standouts, and albums from other labels under the Blue Note catalogue. 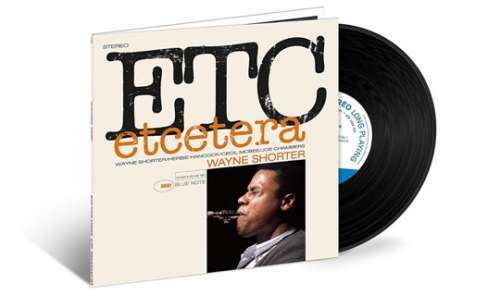 The first two albums in the series—Wayne Shorter Etcetera and Chick Corea Now He Sings, Now He Sobs—will be released on February 8, with Sam Rivers Contours and Cassandra Wilson Glamoured to follow on March 15. See below for a full list of 2019 releases for the Tone Poet Series. Blue Note Review: The 2nd edition of our vinyl boxset subscription series Blue Note Review: Volume Two – Spirit & Time is currently available at bluenotereview.com. Curated by Don Was, the set encapsulates the past, present, and future of Blue Note by celebrating the brilliant late-career albums of the legendary Tony Williams with a tribute album by current drummers, as well as audiophile reissues of Africaine by Art Blakey & The Jazz Messengers and Patterns by Bobby Hutcherson, the book Spirit & Time: Jazz Drummers On Their Art, the zine Out of the Blue, a set of Topps Blue Note Trading Cards, and a Blue Note carbon fiber anti-static record brush. The 3rd edition of the Blue Note Review will focus on the legacy of the label in honour of the 80th anniversary. Blue Note 80 Vinyl Reissue Series: A series of vinyl releases in standard packaging curated by Don Was and Cem Kurosman with albums grouped by themes: Blue Note Debuts, Blue Grooves, Great Reid Miles Covers, Blue Note Live, and Blue Note Drummer Leaders. Releases will begin in May. Blue Note Records: Beyond the Notes Documentary: Director Sophie Huber’s insightful documentary Blue Note Records: Beyond the Notes, which premiered at last year’s Tribeca Film Festival, will see wider distribution this year with theatrical runs and festival showings thru the Spring, TV broadcasts and streaming premieres from the Summer, and a DVD release in the Fall. More info at bluenoterecords-film.com. Canvas Art Prints of Classic Blue Note Album Covers: A new series of limited-edition wall art that celebrates the iconic imagery of Blue Note’s classic era. Blue Note is offering archival-quality, framed canvas prints in dynamic scale (22”x22”, 32”x32”, 42”x42”) that present the legendary album cover designs of Reid Miles and photography of Francis Wolff. 12 album covers are currently available in the Blue Note Store with additional prints to be made available later this year. Blue Note 80th Anniversary Tour: This Fall, a triple-bill of current Blue Note artists—Kandace Springs, James Francies, and the newly-signed James Carter—will embark on a U.S. tour of performing arts centers around the country. PDX Jazz Festival - Blue Note @ 80: The 2019 Biamp PDX Jazz Festival (February 20-March 3) in Portland, Oregon celebrates Blue Note @ 80 with tributes to Art Blakey & The Jazz Messengers, Donald Byrd Steppin’ Into Tomorrow, Joe Henderson Mode for Joe, Hank Mobley Soul Station, Wayne Shorter Speak No Evil, Lou Donaldson Alligator Bogaloo, Eric Dolphy Out to Lunch, and more. Jazz Classics Blue Note Edition on Spotify: Spotify’s dedicated Blue Note Records playlist Jazz Classics Blue Note Edition, which has amassed more than 100,000 followers, has expanded to 80 tracks in honour of our 80th anniversary. Blue Note 80: The Finest In Jazz Since 1939 on Apple Music: Apple Music is featuring Blue Note 80: The Finest In Jazz Since 1939, a new 80-track tour of Blue Note history in honour of our 80th anniversary. Blue Note’s legendary catalog traces the entire history of the music from Hot Jazz, Boogie Woogie, and Swing, through Bebop, Hard Bop, Post-Bop, Soul Jazz, Avant-Garde, and Fusion, and into the diverse and vibrant sounds of today. The artists Blue Note recorded represent the pillars of Jazz history: Thelonious Monk, Bud Powell, Miles Davis, John Coltrane, Cannonball Adderley, Horace Silver, Art Blakey, Jimmy Smith, Dexter Gordon, Grant Green, Lou Donaldson, Donald Byrd, Lee Morgan, Freddie Hubbard, Joe Henderson, Herbie Hancock, Wayne Shorter, McCoy Tyner, Andrew Hill, Ornette Coleman, Cecil Taylor, and many more. After a brief dormancy from 1981-1984 during which producer/historian Michael Cuscuna kept the label’s legacy alive with a series of reissues on EMI, Blue Note returned reinvigorated by the leadership of Bruce Lundvall and has since established itself as the most-respected and longest-running Jazz label in the world, remaining home to some of the most prominent stars and cutting-edge innovators in Jazz while at the same time broadening its horizons to include quality music in many genres. During Lundvall’s 30-year tenure, Blue Note remained a haven for the most creative voices in Jazz, and also had its share of commercial successes from Bobby McFerrin, Dianne Reeves, Cassandra Wilson, Us3, Norah Jones, Al Green, Amos Lee, Medeski Martin & Wood, Willie Nelson and Wynton Marsalis.